The subject of accountability comes up frequently in conversations with my clients. Recently I came across below from sideways thoughts. 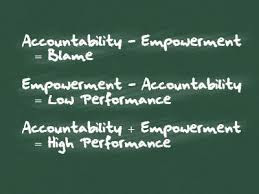 I like the equation of Accountability + Empowerment = High Performance. What I've found in my work with my clients is that empowerment is one of 3 prerequisites to accountability. Empowerment is the opposite of control. I suggest taking some observation time this week and see how many of your employees actually have full responsibility for their actions and those who are under the control of somebody else. What's the one action you could take that would mean more of your employees are truly empowered? A frequent action I see is changing job descriptions to role clarity statements. I've been banging on about this for two decades I know. It is without doubt a crucial action to take. Read more in my post Your work is not your job Make sure you click on the link in the post dispensing with job descriptions for more on role clarity. When we feel valued we bring our best to our work. I suggest here that we need to feel fulfilled and loved as well as valued in order to sustain high performance. What's the one action you could take that would mean your employees feel more valued, fulfilled and loved? I read countless so-called performance development plans. The majority are mostly about the business and very little about helping your employees achieve what's important to them. What's the one action you could take that would mean your employees know in their hearts that you truly believe in them and want to help them to achieve what's important to them? Don't allow yourself to be overwhelmed by any of the above. Do your work - review, have conversations with others, reflect, and then decide on 3 actions you will take, one at a time over the next month. You might surprise yourself with the outcomes of such work and laser focus on the actions. What's the one thing you'll achieve today? Where do you stand on the accountability ladder?